What is DD Form 2870? DD Form 2870, Authorization for Disclosure of Medical or Dental Information is a form used to grant permission to forward personal protected medical information to a third party for insurance, continued medical care, retirement and separation purposes and in other legally justified situations. Filling and signing this form is voluntary. Refusing to sign and submit the DD 2870 form will result in the non-release of protected health information. This form is not used to authorize alcohol or drug abuse information disclosure or information on Alcohol and Substance Abuse Treatment program participation. The form - often incorrectly referred to as the DA Form 2870 - was last revised in December 2003. An up-to-date version is available for download below. All fields of the form must be completed in order for the authorization to be processed. Begin with Section I. This section requires information to identify the individual who wished to release personal information to the third party. Fill in the full name, date of birth and social security number. In the 'PERIOD OF TREATMENT' field state the time period you would like to release information about. If you want a complete copy of your records, list the day you entered the military as the starting date. Tick the type of treatment in Box 5. Section II authorizes the Facility or TRICARE Health Plan you list in Box 6 to disclose your medical information to the third party physician or facility you specify in Boxes 6a and 6b. Boxes 6c and d are reserved for the phone number and fax of that physician or facility. Specify the reason for your request In Box 7. Box 8 specifies the date the entity listed in Section II is allowed to start receiving this information and the date when they will no longer have access to this information. TRICARE For Life Authorization to Disclose Information - this form authorizes your TRICARE For Life contractor to release your protected health information (PHI) guarded under the Federal Privacy Act. 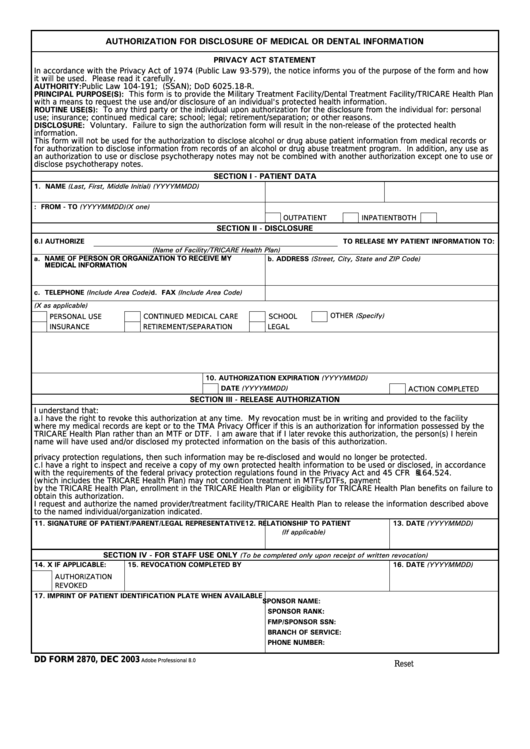 TRICARE Overseas Authorization to Disclose Information - this form is used to give the TRICARE Overseas Program contractor permission to release your PHI. Active Duty Dental Program Request and Authorization for Disclosure of Health Information is used to authorize the release of PHI between spouses, for children 18 years and older or any other person not authorized to receive information without written permission.